The Science Channel will air a TV special on Friday, Sept. 30, 2016, about the Rosetta mission’s visit to comet 67P. This Friday night (Sept. 30), the Science Channel will air a TV special about the Rosetta probe, which is set to crash into a comet that same day. The European Space Agency's (ESA) Rosetta probe has been traveling alongside Comet 67P/Churyumov-Gerasimenko since August 2014. Starting at about 6:40 a.m. EDT (1040 GMT) Friday, the Rosetta probe will begin to spiral slowly down toward the surface of the comet, gathering science data as it goes. The Science Channel special, "Death on a Comet: The Rosetta Mission," will air at 10 p.m. EDT (9 p.m. CDT) Friday. The show will recap the probe's death dive, as well as the science that the mission has uncovered during more than two years of study. The show will be hosted by science journalist Dan Riskin. A signal from Rosetta confirming that it has arrived at the surface of the comet is expected to reach Earth at about 7:20 a.m. EDT (1120 GMT). NASA will host a live broadcast Friday from 6:15 a.m. to 8 a.m. EDT (1015 to 1200 GMT), which you can watch on Space.com. The Science Channel will also interrupt regular programming at 7:20 a.m. EDT (1120 GMT) to show the live coverage of the probe's descent. "Death on a Comet" is the second TV special about Rosetta produced by the Science Channel. "Landing on a Comet — Rosetta Mission" aired in 2014, when Rosetta arrived at Comet 67P. Rosetta launched in 2004 and traveled to Comet 67P with the Philae lander, which touched down on the comet in November of 2014, a few months after Rosetta's arrival at the comment. The solar-powered lander reached the surface successfully but bounced into a shadowed region and was unable to gather enough sunlight to turn on. The probe's final resting place was identified earlier this month. 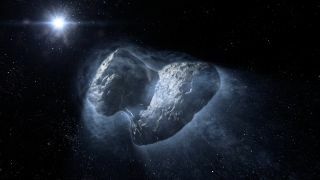 The new special is "the final chapter" in this saga, and will "capture the emotion of this journey's end" and provide "a conclusion to the remarkable 12-year journey — not only to understand how comets work, but also to investigate how comets could have played a crucial role in the evolution of life on Earth," according to a statement from the Science Channel.